If you have followed the newsletter for any length of time, you will know Carrie (two legs) and Chloe (four legs.) 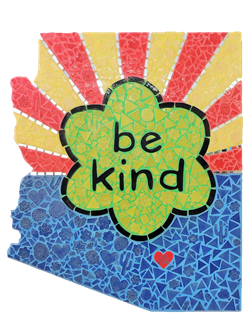 They have been in the Be Kind before, but join it again this week. I received a very nice card from ‘them’ about my mom. The people we can meet out on the loop, and generally around town often display their kind hearts. Try it with someone who may not be expecting it. You will brighten their day. The Angel Charity for Children is active around the region supporting organizations dedicated to touching the lives of children. In the recent past, they have donated over $1M to a variety of such groups. Some of those include the Children’s Clinics for Rehabilitation Services (they deal with autistic kids), Cascade Foundation (helping kids with bleeding disorders), the Diaper Bank of Southern Arizona, and Lead Guitar (introducing music to at risk youth). My favorite is the Therapeutic Ranch for Animals and Kids. I run past it on the Loop several times each week. They work with kids who have a variety of coping needs, using animals as a conduit to health. Through the work, the kids learn about taking care of animals, some science involved with animals, and develop respect for them as well. In the process, the animals serve in a therapeutic role for the kids. It’s a wonderful program, well deserving of the Angel Charity support. Check them out at www.traktucson.org. One more animal related Be Kind. While my mom was at Pepe’s House hospice, three times during those ten days, volunteers came by with puppies, just to cheer up the patients and their families. They are with Pet Partners of Southern Arizona. One we met was Sophie. Listed on her ‘business card’ are her hobbies (napping), her favorite treat (apples), and her favorite quote: “If you can be anything, be kind.” Nice. With Sophie’s favorite quote in mind, I will give you a rundown on what the Mayor & Council approved last week related to the EScooter pilot program. They adopted it over the dissent that came from Shirley and me. We will see a final draft of the EScooter policy in the next month or so, one based on the input staff received last week. If Mayor & Council like what they see in the revised Policy, a vote to implement the Request for Proposal process, and ultimately a 6-month pilot project will follow. Initially, the intent was to get them on the street by May. I guess we will see how these next steps go before knowing that exact timing. In the first draft we were shown, the City was going to choose four vendors for the scooters. At that time, each could deploy up to 500 scooters around downtown. Now, there will be two companies selected. Combined, they may introduce up to 1,500 scooters into the City. Of those, 1,000 will very likely go into the downtown, 4th Ave and Main Gate area (they are illegal on the UA campus), and the other 500 are to go into an economically stressed area. That will probably be some neighborhoods or commercial zones near to downtown. The vendors, of course, want them placed where the population density will assure them customers. The fact that they will be deployed in the stressed areas, does not mean that is where they will stay. Expect 1,500 in and around the streetcar line once the program gets going. The scooters are ‘dockless’. That means, you dump it where you end your ride and the next customer picks it up, does a ride, and likewise leaves it where the ride ends. There are restrictions written into the draft policy on where they can be left at the end of a ride. For example, you can drop it next to a bus stop, but not inside the shelter. You cannot leave it within a certain distance from the front door of a store, and when left on sidewalks, they need to leave at least 4’ of walking space. Enforcement falls to yet another complaint driven process. When say, Caruso’s calls and tells us there are five scooters blocking their entrance, we would call the vendor, and the vendor has two hours to come and move them. If they do not, we go get them and levy a fine against the vendor. We will have our Park Tucson folks helping to manage that process. I do not believe we are staffed appropriately to take on that burden, and I certainly do not believe TPD should be taking their time chasing down improperly parked scooters. That is one of my objections to the policy. Beyond the enforcement issue, is the issue related to where they will be ridden. The scooters are electric. Riding them on the sidewalk is illegal. In other jurisdictions where EScooters are legal, they have similar restrictions. Those other jurisdictions find people ignoring that rule. Conflicts of a variety of sorts have resulted. b. As a consequence of these risks, I may be seriously hurt or disabled or may die from the resulting injuries and my property may also be damaged. That does not sound like an activity the City should be embracing on our streets, but at this time, we are. So, there’s the parking enforcement issue, the illegal driver behavior issue, and the safety issue. There is the clutter on the sidewalks and disruption to businesses. Some on the Mayor & Council feel they will be good for businesses. Possibly, but my vote is based on the presumption that the net impact on the City will be negative. Other jurisdictions have seen some of the frustrations from citizens and business owners responded to in a variety of ways. There has been ritual burial. There’s simply tossing them into the bay, leaving them to be fished out by kind souls. Hanging them on street signs. …and well, less tactful ways of expressing displeasure with them. Of course, we will likely have the guys who just think they’re fun and will use them to express their Christmas spirit. I am looking forward to seeing all of this enter the mix of transportation options around downtown. The final vote is coming back soon. Since these will likely be deployed in Ward 6, and I do not support them, I am inviting anyone who wants to complain about clutter, unsafe or inconsiderate riding, or any other facet of the program to contact the Mayor’s office, or call Wards 1, 2, 3 or 5. Shirley and I will be happy to let those who support deploying 1,500 EScooters handle all of the incoming calls. When I began writing about the upcoming Midtown Tavern Off Track Betting license, I didn’t think it would morph into a series on what’s happening in the horse racing industry generally. It has, and the reason is that it is Turf Paradise, the large for-profit track up in Phoenix that is asking for the Midtown license. I shared the horse fatality rate they are experiencing up there, and last week shared how they are not aggressively addressing the use of strychnine and other drugs administered to their racehorses. I also reported on how Santa Anita racetrack in California had seen 19 horse deaths in the past two months. Well, there is more to share now related to the Santa Anita track. For horse racing buffs, they are entering Triple Crown prep time. The Triple Crown is the Kentucky Derby, held in May, the Preakness, also held in May, and the Belmont Stakes, held in June. Now is the time to be training up your horse for that series of races. There are big bucks, both for the trainers, and big bucks being wagered. Santa Anita is one of the players in the run-up to those races. Instead of having their focus on racing, they are again embroiled in controversy over fatalities at their track. That number is now up to 21 since the end of last year. The most recent was a filly that was ‘put down’ (euthanized) last week after having shattered a bone in her ankle joint. They are again shut down, investigating the causes. They are looking at several possible factors. Heavy rains affecting the track conditions are one. Track compaction at Tucson Greyhound Park was the cause of numerous greyhound injuries. When it is a horse, you are looking at an animal that weighs in excess of 1,000 pounds, with ankles as slim as your own, sprinting on concrete-like footing. It is an accident waiting to happen when ownership cares more about the betting handle than the safety of the horses and jockeys. Santa Anita recently hired a person from Maryland in an effort to boost profits. One way that is being attempted, is by encouraging trainers to run their horses in afternoon races so they would have larger fields in each race. That increases the betting. It also increases fatigue on the animals. That cause of injuries is laid directly on the track operators, and on the horse owners who take part in the over use. California trainers have been averaging three workouts per start. In other parts of the country, they average less than a single training session per start. The injuries and fatalities are depleting the race horse population, also leading to over use. Drug testing is lax. That means horses can be run more easily while having injuries and fatigue masked. What does all of this have to do with this newsletter? One is concern for the care of animals. Look back to when many of us in the community were working to get greyhound racing banned and you will see that I have been consistent in advocating for humane treatment of animals. The other relevance to the City is the upcoming request by Turf Paradise, which is also mired in controversy over injuries to their own animals, to expand their betting abilities into Midtown Tavern here in Tucson. Count on Turf Paradise to be streaming the Belmont Stakes and other races in the Triple Crown into the local bar if we grant the license. As long as we have the ability to exercise any voice in the issue of regulating horseracing, even if only by our role in approving or denying an OTB license, I believe we should. That voice should be refusing to simply play along while the ugly underbelly of the industry is being uncovered. Until the 1950’s, trainers were prohibited from even giving the horse analog of aspirin (Butazolidin) to horses. Now they are racing under the effects of painkillers on a regular basis. In Europe, it is rare for horses to be run while masking injuries or fatigue. In the U.S., the supply of horses is such that they would not be able to fill cards without that being done. You will note that this week I did not even address the monopoly on OTB Turf Paradise is trying to maneuver. More on that as we get closer to the Midtown vote. I also did not give Rillito credit for their plan to work with the UA College of Veterinary Science. The industry needs to clean up its act before that makes a huge difference in the welfare of the animals. I promo’d this last week, and this week it’s a ‘welcome aboard’ to all of the new police officers who went through the graduation ceremony last week. Diana shot this photo of the group pledging into the agency. The recruiting continues. Ward 6 welcomes this new group and looks forward to continuing our support of those who are stepping up to represent the community in public safety roles. To be sure, the RTA has had some positive impacts regionally. Several successful road capacity expansion projects, largely on the outskirts of the City have been completed. We have seen HAWK lights installed, along with assistance in paying for pedestrian crosswalks, bike lanes, transit and sidewalks. To be sure, the RTA has its challenges. One is its rigid adherence to project scope that was found to be unnecessary based on outdated traffic counts. We found that to be the cause of significant push back when designing the Broadway expansion. Another challenge was what we experienced when I began suggesting the RTA look to fund road repair. At the time, the response from them was that I was trying to undermine their mission. Now there seems to be an acceptance that if RTA2 has any chance of passing, road repair needs to be a part of what is being funded. We will have that community discussion if, and when, the Board of Supervisors votes to put the taxing question back on the ballot. Each time I ask for updates on their funding shortfalls, the response is that there are no problems with the funding, despite the well-documented need to shift money around just to keep roadway projects moving forward. The request for an additional half-cent appears to validate the funding shortfall, despite claims to the contrary. The bill is moving its way through the Legislature. If approved, there will then be time to frame what restrictions, and what projects will be included in any RTA2 vote. That is when we see if the focus continues to simply be building more capacity, or if pavement preservation, and amenities consistent with our Complete Streets Policy guidelines will be included on the ballot. Our residents are the primary funding source for the RTA. I will be sure to let you know when it is time to share your thoughts with those who will be making the final decision related to the terms of a renewed RTA. If you have thoughts on HB2109 while it is still being debated in Phoenix, let your Representative or Senator know this coming week. We are about to conclude the public input process related to making changes on travel allowed onto Sentinel Peak. Right now gates to the Park are open Monday through Saturday from 9am until 8pm, and on Sunday from 9am until 6pm. Due to the many safety concerns raised by nearby residents, pedestrians and bicyclists, staff has been actively gathering input related to changes we might make in order to improve safety for all users. Now you can participate in that process through an on-line survey. It is available in both English (https://bit.ly/2ScZNN1) and in Spanish (https://bit.ly/2SxXfoX). Get in your responses to the survey this week. Public meetings to talk about all the input that is gathered are coming up next week. On Wednesday, March 20th the Ward 1 office will be hosting a meeting. It will start at 5:30pm. Their office is located at 940 W. Alameda. Then, on Thursday the 21st, I’ll be hosting a meeting in the Ward 6 community room to hear your thoughts on the access issues related to A Mountain. Our meeting will also begin at 5:30pm. In addition to taking the survey, you can see the process and the input that has been received up to now by checking this link: https://bit.ly/2RWOS65. Join us on the 21st if you have an interest in biking, walking, jogging or driving up A Mountain. We are instituting more changes in our Planning and Development Services Department’s (PDSD) inspection and review process. The goal is to expedite the process while continuing to ensure that the safety of the public is addressed. Effective immediately, inspection services are available either through Skype, or through FaceTime. You still have to schedule an appointment, but this new process saves the time of going down to PDSD, or having an inspector come out to the job site. You will need a 4G Smart Phone in order to do the remote inspection. If the project is complex, you may not be able to complete all of what you hope to with this new method. However, the new program will help small-to-mid sized jobs moving along at an efficient pace. Use this link to learn about the whole program. http://bit.ly/2IlUcMZ. Through my work on campus I know first-hand how waiting for inspections, and doing reviews after initial inspections, can be costly both in terms of time and money. I am grateful to our PDSD staff and the City Manager for working to get this in place. Coming this month are two important presentations. Each has as its focus those most in need in our community. The first event is coming this Saturday, March 16th over at the El Rio Neighborhood Health Center. In collaboration with the UA College of Pharmacy, and the City Parks and Recreation department, El Rio is hosting their annual Health Fair. The focus is on providing free health services and information. Included will be screenings for osteoporosis, diabetes, blood pressure checks, cholesterol, vision and they will check your lungs and breathing. It is not all just an institutional health care event though. They will also have face painting, raffles and other activities. The event runs from 10am until 1pm. El Rio is located at 1390 W. Speedway. They will have bilingual translators on site so everyone can take part. Next, on Thursday, March 21st, join Stacy Butler and a panel of other experts in a discussion on the true costs associated with evictions in Pima County. Stacy directs the Innovation for Justice Program at the Rogers College of Law on the UA campus. The event will build on her work in providing pro bono civil legal services to low-income families in Pima County. The title of the presentation is The Eviction Problem in Pima County: What can we do? It will run from 6pm until 8pm at the downtown library – 101 N. Stone. Both of these events touch some important local issues. It would be great to see each get lots of participation. This is a reminder of the public meeting to see the most current plans for redevelopment of the monastery site. Ross Rulney and his design team will host the meeting on Wednesday, April 17th at 6pm. It will be held inside the chapel at the Benedictine. For previous events, we have invited people to enter from the south entrances. This time, due to our hosting migrant families in portions of the building, people coming to attend the design presentation will be entering right through the chapel doors facing Country Club. This is the first formal neighborhood presentation that will be given since the neighborhood Plan Amendment was approved by Mayor & Council. A design advisory group has been meeting to provide neighborhood input on how the design is evolving. The process will make its way through more public meetings in front of the Zoning Examiner, and ultimately to Mayor & Council for more public comment. If the development is important to you, getting your thoughts known early in the process is clearly better than coming in at the end. The migrant families continue to arrive at an alarming pace. When we began this work down at the Greyhound Bus Depot nearly four years ago, ICE would drop off groups of four or five. If a dozen people were delivered at a single time, that was considered to be a large group. Now we are seeing 60 and 70 at a time. The need for donated goods continues. Here is a list of current needs. Please bring whatever you are able to the Ward 6 office during business hours. This work is supported, and managed by the compassionate hearts of Tucson resident volunteers. I am grateful to all of you who are helping in whatever ways you are. For those people coming to the 3rd Street Bike Boulevard mediated session at the monastery, we will also be asking you to enter through the main chapel doors. That meeting is on Wednesday, April 3rd beginning at 6pm. This week’s Local First is a birthday party. On March 16th and 17thBuffalo Exchange will be hosting pop-up events in celebration of their 45th birthday in Tucson. Kerstin and her daughter Rebecca Block run the place, and they have since its inception. I am partial to their 2001 E. Speedway location because it has become an easy stop for me to pick up a Christmas gift card for my bride. Correct – I long ago learned to avoid trying to pick out clothes for her. If you are not familiar with their operation (unlikely), it is for bargain hunters. However, the clothing they sell is of very good quality so if you are taking in things to trade, you should know in advance that they will not take junk. Stop by and thank the women for being a part of Tucson and our local economy for so long. I am certain you will end up leaving with some goodies. Above I highlighted two important events that address the needs of low-income residents throughout the community. There are two more events coming this week that address environmental issues. The first one will be held tonight, March 11th over at the Sam Hughes Elementary School. Kathy Jacobs is the Director of the UA Center for Climate Adaptation Science. She will lead a discussion on building resiliency into our community and preparing for the inevitable summer heat. The event is co-sponsored by Physicians for Social Responsibility. It is legit. I am grateful to the Sam Hughes neighborhood leadership for inviting me to take part in promoting the event. It is not pie-in-the-sky ideas, but instead you will hear some very practical ways you can be ready for grey-outs, and other heat-related impacts. This flyer has all of the information you will need in order to come and be a part of the event. Then, the following evening, come to the Ward 6 office and join the Sustainable Tucson group for a discussion about our new Complete Streets Policy. Doors will open at 5:30, and the event will start at 6pm. We adopted the draft Complete Streets policy. I have written about it quite a bit in the run up to our vote. More public outreach is taking place right now, and I am hopeful that by the end of the year we will have some real guidelines that will direct how we design corridors. Not how we lay asphalt, but how we design corridors in ways that make sense for all modes of travel, including your feet. This is the Sustainable Tucson monthly meeting so come, and learn about how you can join the group. They meet in our community room every month and have some lively topics to kick around. I hope to see you on Tuesday. Earlier I mentioned the RTA2 vote that is coming. Having the RTA buy into our Complete Streets design policy, and extending it region-wide will be an important part of the conversation as we collaborate in defining the scope of what they put to the voters. So…we’re close, but not quite. The MMM leadership has targeted their 10th birthday party on April 15th for hitting the 238,000 goal. Based on what we have been averaging weekly, that will be close. Join and help us get there over the next 4 weeks. 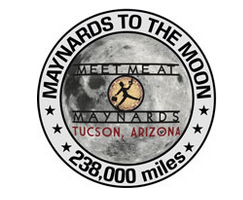 Here is the link for you to sign up, www.meetmeatmaynards.com. March’s Fair Weather brings us to the Jewish History Museum, who is generously cosponsoring this event. Plus our headliner all the way from L.A.
Michael Longfellow is a stand up, writer, and stepson from Phoenix, now based in Los Angeles. While in Arizona, Michael was a regular at the Tempe Improv and Stand Up Live. Shortly after his move to Los Angeles, he placed 2nd at the Laughing Skull Comedy Festival in Atlanta, was chosen as one of TBS’ Comics To Watch, did Stand up on CONAN and can now be seen on Hidden America with Jonah Ray.